Sunday, April 8, £15, 3pm, The Hawth Studio, Crawley, 01293 553636. One of the great British jazz voices performing some of the 20th century’s most iconic songs. Accompanied by brilliant pianist Barry Green, Elaine will include classic arrangements of Gershwin and Cole Porter such as ‘S’Wonderful’, ‘Embraceable You’, ‘Begin the Beguine’, ‘Night and Day’, ‘Summertime’ and ‘I Get A Kick Out Of You’ as well as songs from other composers. Saturday, April 7, 7.30pm, £28.50, The Capitol Theatre, Horsham, 01403 750220. Legendary folk-rock pioneers Lindisfarne return with a classic six-piece line-up of long-time members fronted by original founder-member Rod Clements on vocals, mandolin, fiddle and slide guitar. With a repertoire of unforgettable songs like ‘Meet Me On The Corner’, ‘Fog On The Tyne’ and ‘Run For Home’, Lindisfarne’s power to galvanise festival and concert audiences remains undimmed and is guaranteed to get the crowd on its feet and singing along. 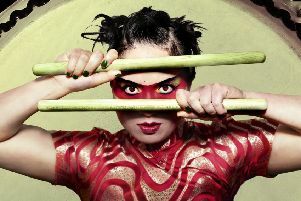 April 7, £21.50, 7.30pm The Hawth, Crawley, 01293 553636. No Jacket Required, the UK’s leading Phil Collins tribute, perform the songwriter’s music in a faithful recreation of his live shows. This week they return to The Hawth as part of their 15th Anniversary Tour. Frontman Dave Whitehouse spent five years in a Genesis tribute before forming No Jacket Required in 2002. The band have performed all over the country as well as overseas. Sunday, April 8, 12pm and 3.30pm, The Hawth Theatre, Crawley, 01293 553636. Starring Milkshake! favourites Bob the Builder, Little Princess, Noddy, Fireman Sam, Shimmer and Shine, Pip from Pip Ahoy, Winnie and Wilbur, Wissper, Milkshake’s very own Milkshake! Monkey and two Milkshake! presenters, this all singing, all dancing, musical masterpiece will take audiences on a journey through the world’s favourite fairy tales. Monday to Saturday, April 9-14, Theatre Royal, Brighton, 0844 871 7650. Flashdance – The Musical is the inspiring and unforgettable story of Alex, a determined welder who dreams of becoming a professional dancer. When a romance complicates her ambitions, she harnesses it to drive her dream of attending Shipley Dance Academy. Prepare to be blown away by an astonishing musical spectacle with phenomenal choreography to this iconic score, including the smash hits ‘Maniac’, ‘Gloria’, ‘I Love Rock & Roll’ and the sensational title track ‘Flashdance... What a Feeling’. 6. Josienne Clarke & Ben Walker. Wednesday, April 11, Komedia, 44-47 Gardner Street, Brighton, 0845 293 8480, www.komedia.co.uk. With the release of Overnight, Josienne Clarke (top circular picture) and Ben Walker have created an album with blanket-warm production and a perfect pairing of vocals and virtuosic guitar. While much of their music is characterised by lush chamber ensemble orchestrations, what sets them apart is the combination of Josienne’s emotionally affecting voice and Ben’s intricately expressive guitar technique. They cite Sandy Denny, June Tabor, Nic Jones and Pierre Bensusan as influences. Wednesday, April 11, £12.50-£20, 5pm/8pm, Chequer Mead, East Grinstead, 01342 302000. This is one of the best known love stories of all time, performed by Vienna Festival Ballet. Lavish costumes, stunning scenery, international stars, and the glorious music from Tchaikovsky combine for a magical and unforgettable evening. Swan Lake is the most popular ballet in the world and captures an incredible range of human emotions – hope, despair, terror, tenderness, melancholy and ecstasy. 8. Grumpy Old Women to the Rescue. Wednesday, April 11, £17, 7.30pm, The Hawth Theatre, Crawley, 01293 553636. Suited and booted in superhero outfits and ready to save the day, three mature ladies in the form of the Grumpy Old Women (bottom circular picture) are coming to the rescue. Comedian Jenny Eclair has joined forces with Olivier Award-nominated performer Dillie Keane and comedy actress Lizzie Roper for their latest tour. Fed up with always having to be in charge, the Grumpy Old Women have put their feet up in retirement, free at last to practise their extreme colouring-in, ukelele orchestra and novelty fudge-making. But with the world in a bigger mess than ever before, is there anything that can tempt them off their backsides to unleash their superpowers and once more come to the rescue? Find out more at www.grumpyoldwomenlive.com. Thursday, April 12, The Hawth Theatre, Crawley, 01293 553636. The World’s Official No.1 Eagles tribute returns to The Hawth for another outstanding performance, promising more of their trademark musical prowess, acute attention to detail, and incredible showmanship to wow Crawley audiences as usual. This phenomenal group of musicians have been touring for over two decades and remain true Eagles fanatics. Their longevity and continued international acclaim are due in no small part to their extraordinary mastery of the Eagles’ distinctive sound. This concert features the very best from the Eagles’ repertoire including ‘Hotel California’, ‘Take it to the Limit’, ‘Life in the Fast Lane’, ‘Take It Easy’, ‘Lyin’ Eyes’, ‘Desperado’ and many more. Visit illegaleagles.com. 10. Dad’s Army Radio Hour. April 12, 8pm, £16, The Capitol Theatre, Horsham, 01403 750220. Two actors play 25 characters in this staging of classic radio scripts based on favourite episodes from the original TV series. Double Fringe First Award winner David Benson (star of Think No Evil Of Us: My Life With Kenneth Williams) and Jack Lane (Wisdom Of A Fool) present a selection of classic radio episodes featuring favourite lines, cherished characters and great feats of vocal impersonation.